When your kitchen sink that has a sprayer as well as a water spout suddenly has no water flowing out of the spout, while the sprayer continues to work properly, you need to look at the potential causes of the problem. Restoring the flow of water to the faucet's spout does not require plumbing expertise. Buildup in the faucet's spout may be why no water flows out. Any sink with a separate water spout and sprayer has a diverter valve. Shower and bathtub combination faucets also have diverter valves, which you activate by pulling up on the post on the spout, but the diverter in a kitchen sink is not in such an obvious spot. The diverter sits at the base of the water spout, near where the sprayer's hose connects to the water faucet. The diverter is completely hidden from view, sitting under a cap you have to remove to access it. Normally, a bad diverter results in water not flowing out of the sprayer, while the water still flows from the spout. Still, you can remove the cap from the base of the spout with pliers and use a quarter to twist the diverter counterclockwise out of the faucet, and then install a replacement in the reverse order. Sediment may be present in your house's plumbing at any time, affecting how different plumbing fixtures operate. Sediment may come from a water main break in the area near your house, with pieces of sand or dirt coming into the water supply. Pieces of pipe shavings may break off when you restore the water to your house's plumbing too quickly. Pieces of sediment from the water heater may also break off and flow into the water pipes, adding to the sediment buildup. Hard water deposits may accumulate inside water pipes, and then break off. The diverter valve in your kitchen sink faucet may be partially clogged with sediment, which you can clean out by removing the diverter valve and flushing it with water. 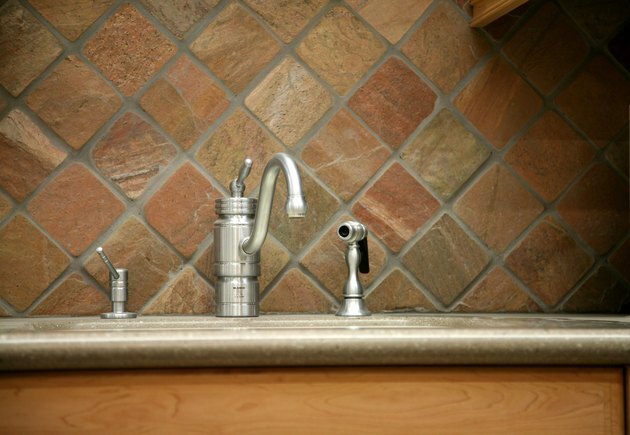 Your kitchen sink's water spout has an aerator, or a screen on the spout opening that keeps sediment from the water line from flowing into the sink, your water glass or anything else you fill up with water. The aerator can become completely clogged with sediment, meaning no water can flow out of the spout, while it flows out of the sprayer freely. You must untwist the aerator from the spout's opening, using a pair of pliers wrapped with duct tape to protect the faucet's finish. Flushing out the aerator with water removes the sediment buildup. 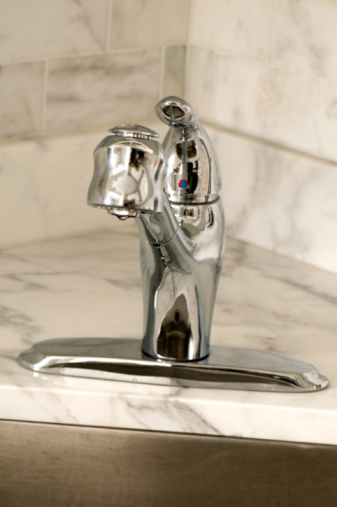 While not as likely as a clogged aerator, your faucet's spout may have a blockage made up of sediment or even hard-water scale. You must shut off the water to the faucet using the handles under the sink and take apart the faucet, removing the spout from the base. If you cannot reach the blockage, submerse the spout in vinegar overnight. The vinegar is acidic and breaks up deposits enough so that flushing the spout with water the next day should dislodge the blockage.